If I told you that there was a way to give your ads 50% more headline space, and twice the length of descriptions, how would you respond? Likely, you’d be jumping for joy. Well, that opportunity is here with Responsive Search Ads for Google Ads. What Do These Ads Do For You? First, these ads give you more real estate in the SERPs. 85.71% more, to be exact. This new ad unit displays up to three headlines of 30 characters each, simultaneously. It also displays up to two lines of description, up to 90 characters each. 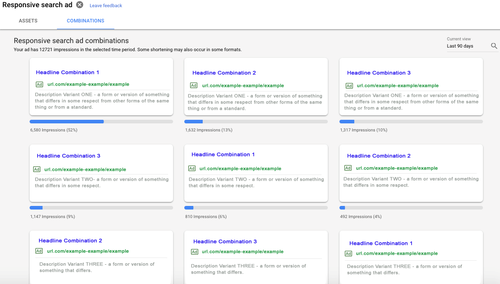 These multiple ad elements mean that Google can employ its machine-learning skills to identify which elements of your ads are most effective over time. You no longer have to rely on a series of A/B tests, you learn much faster which ad elements are effective, and can react almost immediately. Lastly, Responsive Search Ads adapt to the different display needs of mobile and desktop placements independently. 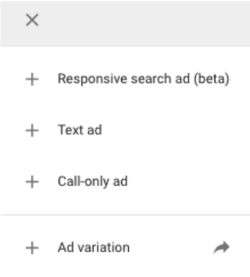 This means your ad may only display two headlines and/or one description on mobile… but Google will ensure that your ad fits the space provided. While you can display up to three headlines, Google allows you to input up to fifteen. And you can see up to two descriptions, but you’ll input up to four of them. Assets can appear in any order, so all the elements need to work singularly and together. So how do you keep this from becoming a mess? First, let’s talk about the headlines. When you get to the ad creation wizard, you’ll see that there are a bunch of fields for headlines, and a button to add more. These are useful to control where certain text displays. Keep “one step removed” in mind. Use your top expanded text ad, pin the top two headlines, and create a variety of new headlines for the third spot. Since it’s Search, make sure you’re including keyword phrases wherever possible. If you’re feeling really creative, you could create variations on all three spots, and pin multiple variations in the same slot. If you’re feeling trusting, leave it all to Google. The process is the same for the descriptions. Take your existing high-performing ad and use that description. Then, consider how you can expand on it. If you want to make sure that a description always shows, pin it in location one. The caveat here is that you need to ensure that description is under 80characters. You’ll easily see the responsive ads in your ad groups display along with your expanded text ads. All the same stats apply. You should immediately see what impact these ads are having in your ad group. Depending on your traffic volume, I recommend you allow between a few days to a few weeks, before you make a decision on whether they are performing for your ad group. For a more detailed analysis of your ads, there’s a bit of a Smart Display effect going on, where full reporting isn’t available for each ad iteration. However, you can see which elements and complete ad units get more impressions – which is a good indicator of where clicks will be coming from. When you’re ready to give these a try, remember these little tips. Try thinking about the first three headlines as if they’ll appear together. This will give you a good idea to create a solid group of headlines. Don’t be afraid to pin! You can make sure that certain elements are always visible by pinning them. 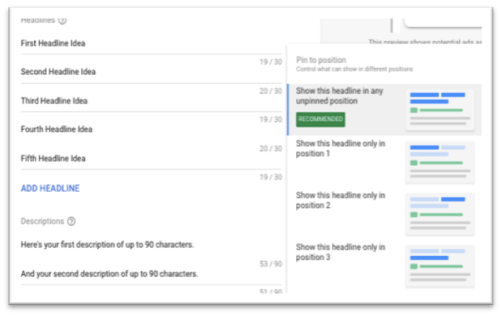 Focus and build on benefits, keywords, and calls-to-action in headlines if you want to include additional headlines for the rotation. Make sure you remember to include keywords in at least two of your headlines or more if possible. Think about your descriptions in groups of two – but make sure they still work independently. I’ll keep my eye on how Responsive Search Ads evolve and update you on any new developments. For now, it seems to be a definite win and I strongly recommend you explore its possibilities because 50% more headline space and twice the length of descriptions resulting in 85.71% more real estate in SERP, is an opportunity not to be missed.